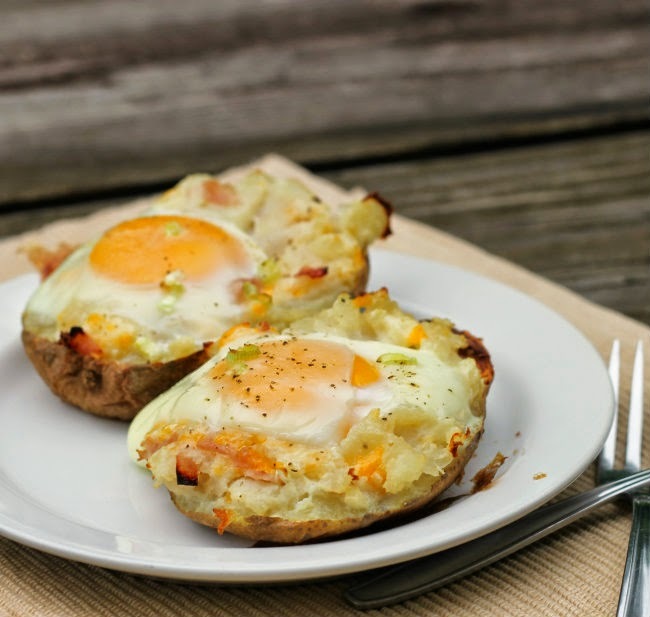 Try something fun for breakfast… egg stuffed potato. I know I say this all the time on this blog… “I am a breakfast person!” When I wake up in the morning it is breakfast time, I am ready. During the week I need to be at work in the morning so breakfast is nothing fancy. I will have a piece of fruit and then maybe a bowl of cold cereal, or maybe if I am in the mood a bowl of oatmeal, and then sometimes if I am really hungry the cereal will be accompanied by a piece of peanut butter toast. But when the weekend rolls around I like to have a little fun with my breakfast. This is when I like to try new things, especially on Sundays when I don’t have to rush. I love eggs; it doesn’t matter if there scrambled, fried, or whatever I just love them. I have seen recipes on the web with avocados and potatoes stuffed with eggs and they really caught my eye. The potatoes ones really got my attention the most; I am a really big fan of eggs and hash browns. There is just something about the combination of these two things that make a great breakfast for me. 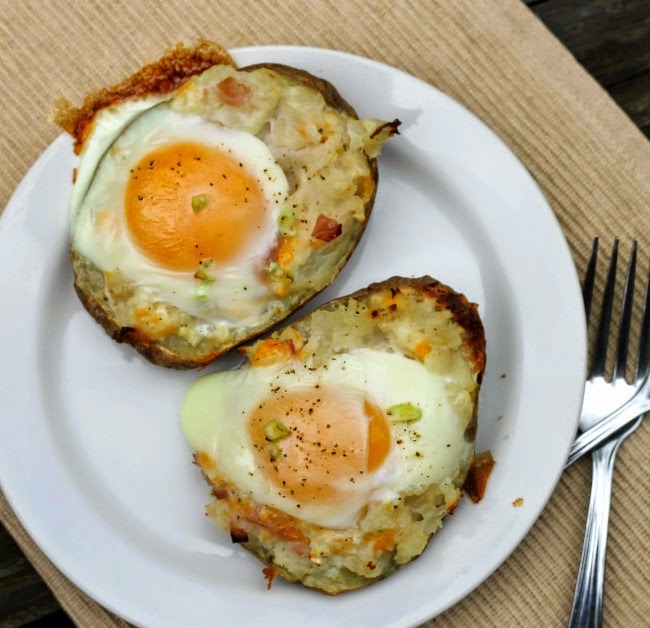 An egg stuffed potato is a meal all in one; really you can add just about anything that goes with eggs and potatoes. I loved how the potato skins got nice and crisp after it was done baking. The whole egg and potato thing comes together so well… I would say try it if you like eggs and potatoes you will love it. 3. Mix the potatoes with your ham or bacon, cheese, onion, or whatever ingredients you may want to use. Season with salt and pepper to taste. 4. Add the potato mixture back into the potato skins. Crack an egg on top of the potato mixture. Don’t worry if a little of the eggs spills over the side it will bake onto the potato. Sprinkle a little salt and pepper over top of the egg along with a little onion, ham, and cheese if you would like. 5. Place the potatoes on a baking sheet that has been sprayed with a non-stick cooking spray. 6. Place in the preheated oven and bake for about 15 to 20 minutes or until the white of the egg is set and the yolk is to your liking. 7. Remove from oven and serve. You may cool just a bit, before serving. I might just make this for dinner instead of a Spanish tortilla (which is really a potato omelet). The ingredients are almost the same. 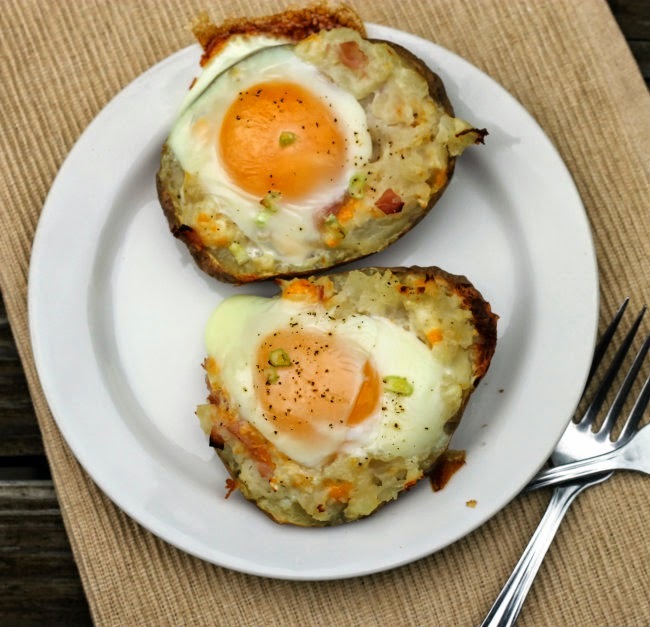 I like topping just about anything with an egg…but I haven’t thought of a baked potato! Genius! I can’t even tell you how much I love this idea. Everyone in my family would be thrilled to be served this dish. These look insanely delicious Dawn! I would love this for any meal! It makes a great presentation. Now THIS looks like a hubby pleaser! What a terrific breakfast idea! Like this idea Dawn, egg and potato…great combo. Wow. This is wonderful! I’m not much of a breakfast person, but would love this for dinner! Really creative idea — thanks.